GSJHM: "To Educate & Practice, True Christian Faith-Living Daily." "What have you done to reach out this week to a lost person?" At Good Shepherd Jr. High Ministry, we believe that above all else, a relationship with Christ is the single most important thing. It is through a personal relationship with Christ that one finally finds peace and love. So the question is, how does one find this personal relationship? Step 1: Do You Know?? Do you know for sure that you are going to be with God in Heaven? If God were to ask you, “Why should I let you into My Heaven?” what would you say? You don’t know? Then we have the best news you could ever hear! The few minutes it will take you to read these steps to life may be the most important time you will ever spend. Did you know that the Bible tells how you can know for sure that you have eternal life and will go to be with God in Heaven? The Bible says, “ . . . the gift of God is eternal life through Jesus Christ our Lord” (Romans 6:23). And because Heaven is a gift, like any other genuine gift, it is not earned or deserved. No amount of personal effort, good works, or religious deeds can earn a place in Heaven for you. “For by grace are you saved through faith; and that not of yourselves: it is the gift of God: not of works, lest any man should boast” (Ephesians 2:8,9). WHY is it that no one can earn his way to Heaven? Because . . .
Man is a sinner. “For all have sinned, and come short of the glory of God” (Romans 3:23). Sin is transgressing God’s law and includes such things as lying, lust, cheating, deceit, evil thoughts, immoral behavior, and more. And because of this, man cannot save himself. If you wanted to save yourself by good deeds, do you know how good you would have to be? “Be therefore perfect, even as your Father which is in Heaven is perfect” (Matthew 5:48). With such a high standard, no one can save himself. However, in spite of our sin . . .
God is merciful, and therefore doesn’t want to punish us. This is because “ . . . God is love” (1 John 4:8). And He says, “ . . . I have loved you with an everlasting love” (Jeremiah 31:3). But the same Bible which tells us that God loves us, also tells us that God is just and therefore must punish sin. He says “. . . (I) will by no means clear the guilty . . .” (Exodus 34:7). And “. . . the soul that sinneth, it shall die” (Ezekiel 18:4). We have a problem. God solved this problem for us in the Person of Jesus Christ. Who is He? The Bible tells us clearly that He is the infinite God-Man. “In the beginning was the Word (Jesus). . . and the Word (Jesus) was God. And the Word (Jesus) was made flesh, and dwelt among us . . .” (John 1:1,14). Jesus Christ came to earth and lived a sinless life, but while on earth, what did he do? He died on the cross to pay the penalty for our sins and rose from the grave to purchase a place for us in Heaven. “All we like sheep have gone astray; we have turned every one to his own way; and the Lord hath laid on Him (Jesus) the iniquity (sin) of us all” (Isaiah 53:6). Jesus Christ bore our sin in His body on the cross and now offers you eternal life (Heaven) as a free gift. This gift is received by faith. Saving faith is not mere head knowledge, like believing certain historical facts. The Bible says that the devil believes there is one God, so believing that there is one God is not saving faith. Saving faith is also not mere temporal faith, that is, trusting God for temporary crises such as financial, family, or physical needs. Now these are good, and you should trust Christ for these, but they are not saving faith! Saving faith is trusting in Jesus Christ alone for eternal life. It means resting upon Christ alone and what He has done rather than in what you or I have done to get us into Heaven. “. . . Believe (trust) on the Lord Jesus Christ, and you will be saved . . .” (Acts 16:31). 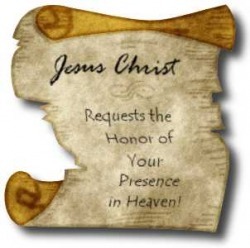 The question that God is asking you now is would you like to receive the gift of eternal life? Accept and believe Christ as your Savior from your sins. “For with the heart man believes unto righteousness; and with the mouth confession is made unto salvation. For whosoever shall call upon the name of the Lord shall be saved” (Romans 10:10,13). The Gospel, also known as The Good News, is God's covenant love story of seeking His people. Because of sin and sin's penalty (Gen. 3), we were separated from God. Yet God created us to be with Him, who cannot stand sin. So there had to be something or someone to take our place. The penalty for sin is death... and Jesus took that penalty. He was and is the perfect Savior. Jesus, the God-Man, was/is sinless -- He obeyed the law perfectly and lived the perfect life in order to redeem us. When He was nailed on the cross, He was executed by a criminal's (sinner's) death. In so doing, He took our sins upon Himself, and experienced the condemnation of God's fierce wrath against sin. But at the same time, Jesus imputed ("gave") us His righteousness so that when God "sees" us (those who accept and believe who Jesus was and did for us), God sees the righteousness of Jesus covering us and protecting us. Not because of anything we did in and of our selves...but because of grace... a free gift. Look at what Jesus promises to those who believe in Him: “. . . I say unto you, he that believes on Me has everlasting life” (John 6:47). Step 8: Welcome to God’s family! If you have truly placed your trust in Jesus Christ’s sacrificial death you are now a child of God! Forever! “But as many as received Him, to them gave He power to become the sons of God, even to them that believe on His name”(John 1:12). Read the Bible : Starting with the Gospel of John, read a chapter each day. “As newborn babes, desire the sincere milk of the Word (of God), that you may grow thereby” (1 Peter 2:2). Pray: Spend time each day talking with God. “Be anxious for nothing; but in everything by prayer and supplication with thanksgiving let your requests be made known unto God” (Philippians 4:6). Worship: Regularly attend a church that honors Jesus Christ and teaches you the Bible. “I was glad when they said unto me, Let us go into the house of the LORD” (Psalm 122:1). “God is a Spirit: and they that worship Him must worship Him in spirit and truth” (John 4:24). Fellowship: Join with Christians who will help you grow in faith. “That which we have seen and heard declare we unto you, that you also may have fellowship with us: and truly our fellowship is with the Father, and with His Son Jesus Christ” (1 John 1:3). Witness: Tell others what Jesus Christ means to you! “But you shall receive power, after that the Holy Ghost is come upon you: and you shall be witnesses unto Me . . .” (Acts 1:8).